Radeon RX Vega 64 is the latest flagship graphics card from AMD, and GeForce GTX 1080 is a high-end graphics card from Nvidia in the GeForce 10 graphics card series. Both of these graphics cards are meant for high-end gaming and are competitors of each other. Radeon RX Vega 64 is a much newer product and is the top-end graphics card from AMD while GeForce GTX 1080 is also power packed and is one of the most powerful graphics cards for gaming today. 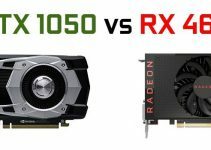 Here in this post I am going to compare both these powerful graphics cards, so that you can easily decide that which one you should buy for your gaming PC. Important Note: Radeon RX Vega 64 is available in both air cooled and liquid cooled version. Here I am comparing the normal air cooled variant of Radeon RX Vega 64 to reference Geforce GTX 1080. Here is the comparison Radeon RX Vega 64 and GeForce GTX 1080 graphics cards based on their performance, features and specifications. Radeon RX Vega 64 is built on the latest Vega GPU architecture from AMD. Radeon RX 500 and RX 400 series graphics cards were built on the Polaris GPU architecture which was also very powerful and efficient. The newer Vega architecture is very advanced and utilizes HBM2 memory and offers much higher bandwidth and speed. Radeon RX Vega 64 comes with whopping 4096 Stream processors and has got 64 Compute Units (CU). On the other hand, GeForce GTX 1080 is built on the latest Pascal GPU architecture and comes with 2560 CUDA Cores. Well, Radeon RX Vega 64 does comes with much higher number of pixel processors but we cannot equate stream processors to cuda cores as both are based on different technologies and have different way of working. You can read more about them by going to the link given below. Radeon RX Vega 64 comes with 8GB HBM2 (High Bandwidth Memory 2) having 2048-bit interface. HBM2 is the latest and most advanced memory that offers much higher bandwidth and is almost twice as fast as GDDR5 memory. On the other hand, GeForce GTX 1080 comes with 8GB GDDR5X memory having 256-bit interface. GDDR5X memory is faster than the regular GDDR5 memory. The memory bandwidth of Radeon RX Vega 64 is 484 GB/s which is considerably higher than that of Geforce GTX 1080, which has memory bandwidth of 320 GB/s. The higher memory bandwidth of Radeon RX Vega 64 will help you to run latest games on much higher resolutions without any lag. So in terms of memory performance, Radeon RX Vega 64 is clearly ahead of Geforce GTX 1080. Both these graphics cards are VR Ready and come with variable refresh rate technologies to avoid screen tearing and stuttering in games. The variable refresh rate technology from Geforce GTX 1080 is G-Sync while AMD Radeon RX Vega 64 uses FreeSync 2 technology. Both of these technologies works great but in my opinion FreeSync 2 is a little better. Also both these graphics cards support multi-GPU technology, Radeon RX Vega 64 supports CrossFire and GeForce GTX 1080 supports SLI. Both of these graphics cards support latest graphics APIs including DirectX 12, OpenGL 4.5 and Vulkan. But here also, if talk about Vulkan then AMD is ahead of Nvidia in terms of performance in latest Vulkan Games like DOOM (2016). Also in DirectX 12 titles, latest AMD graphics cards are known to perform better than Nvidia graphics cards. 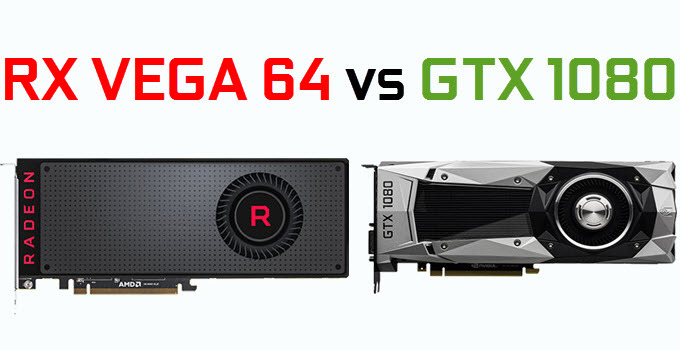 The performance of both these graphics cards in gaming is neck to neck. However, Radeon RX Vega 64 is a bit faster than GeForce GTX 1080 but is slower than the mighty GeForce GTX 1080 Ti. Both these graphics cards can run latest games on Ultra graphics settings at 1440p and 4K resolution. For running latest AAA games on 4K, you might have to lower down some of the in-game graphics settings depending on how demanding the game really is. If we talk about computational performance, then also Radeon RX Vega 64 is ahead of GeForce GTX 1080. Radeon RX Vega 64 has performance of 12.7 TFLOPS while GeForce GTX 1080 scores 9 TFLOPS in FP32 benchmarks. Also Radeon RX Vega 64 is a better cryptocurrency mining graphics card because of its raw computational performance. When it comes to power consumption then GeForce GTX 1080 is clearly the winner. This is because GTX 1080 has maximum power consumption of 180 Watt (TDP) and requires only a 500W power supply, whereas Radeon RX Vega 64 has maximum power consumption of 295 Watt TDP and needs a 750W PSU for its working. 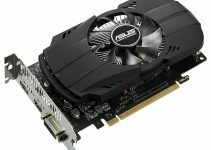 Both these graphics cards are priced similarly and different graphics card manufacturers have their own pricing depending on the cooling solution employed. 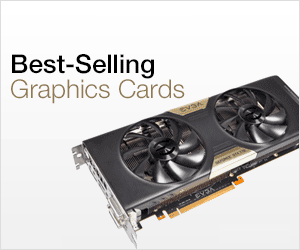 You may check the latest prices of these graphics cards from the links given below. There is no denying fact that Radeon RX Vega 64 has better specifications, performance and comes with advanced features. Also the card is very competitively priced and is a real value for money high-end graphics card. The only slight disappointment is its relatively higher power consumption which can be an issue for some users.You can pair this card with latest AMD Ryzen Threadripper processor for blazingly fast performance in latest games. Radeon RX Vega 64 is a card that I would like to pick between the two and is highly recommended for high-end gaming at higher resolutions, but if power consumption is your priority then GeForce GTX 1080 is also as good as the Radeon RX Vega 64.